Secluded and newly renovated stone cottage situated on the Isle of Ulva overlooking sea inlet. 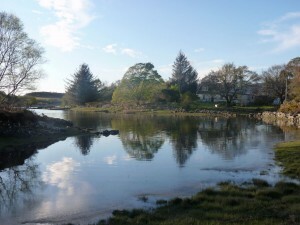 Only five minutes walk from Ulva Ferry and the Boat House restaurant. The Fisherman’s is an idyllic base for appreciating the quiet ambiance of Ulva, whether walking the signposted trails and wilderness, or just absorbing the immediate surrounds of the cottage. The Boathouse is only a 5 minute walk away, serving seafood, soups, and home baking. The Cottage sleeps 4, with 2 bedrooms, sitting room, dining/breakfast room, kitchen, cloak-room, and downstairs bathroom. See more images here.